Many Americans worry when the defining features of one group are used for commercial purposes by another. Identity politics defines our age and is scattered through the nation’s history. A nation spread across a continent is bound to be divided into regional and social allegiances, even though these social anchors often trigger thoughtless comments and lasting resentments. We are all complicit. Thinking in terms of one’s own community first is a natural impulse. But inevitably sensitivities can be stepped on when ‘outsiders’ adopt or imitate another group’s practices and traditions. This is a familiar issue with the names of the Washington Redskins and the Cleveland Indians. Are these sports teams entitled to use native American symbols? Is the use of key words and symbols an inherent complement to the first Americans, or a commercial gambit the teams are not really entitled to? Legal entitlement is one thing. Cultural entitlement is less definitive, if no less involving. As with so many linguistic issues, applications of a group’s lexicon or symbols are almost always subject to different understandings. And in these days when nerve endings are more exposed, the appropriation of any group’s names and artifacts can raise eyebrows. In our climate of discontent, even viewing a mainstream Hollywood film from a previous decade can make us queasy. Why are there only African American actors in 50’s comedies playing maids or butlers? Why was the lead in the popular Charlie Chan series given to a Swedish American? What may seem like acts of empathy or flattery to one person can be another’s example of expropriation. No short essay can do this subject justice. But the questions we might ask are still valuable. While Americans in the 21st Century are more open to claims of “cultural misappropriation,” we are still search for the outer limits of this kind of critique. Who gets to be an authority on Thai or Mexican food? Who gets to be a French chef? 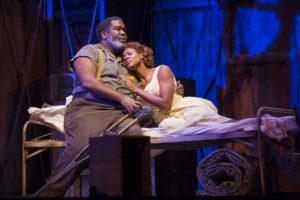 Likewise, did George Gershwin and DuBose Heyward step over the line to write the iconic black opera, Porgy and Bess? I’m glad they did. But was the story of the impoverished residents of Charleston’s Catfish Row theirs to tell? In its time (1935) Porgy was a daring extension of a tradition-bound form. But what may seem like acts of empathy or flattery to one person can be another’s example of expropriation. We can all cite less cosmic examples of cultural infringement. When I was a visiting professor years ago I can remember my chagrin when otherwise wonderful British colleagues greeted me with an over-the-top “Howdy Partner!,” delivered in a theatrical Midwestern drawl. Minor stuff for sure; I suppose I could have responded with a fake Lancashire accent. But what would be the point? I would have preferred a greeting in their own voice. Is there a legacy–a history, an origin–that is a community’s property, but not necessarily the culture’s? This issue raises the question of what constitutes fair use of a group’s symbols. Does the existence of a common language within the culture extend to the words and images associated with a specific sub-group? Or is there a legacy–a history, an origin–that is a community’s property, but not necessarily the culture’s? In a famous essay the journalist Walter Benjamin considered a related problem: the difference between original works of art and the sometimes convincing copies made of them. “The work of Art in the Age of its Technological Reproducibility” raised better questions than answers. But he did make the point that an original retains an “aura” that will always make it different and special, even while it may be cheapened by its copies. Our age has simply pushed the discussion forward to the moral question of whether those outside an exploited group have the right to use elements of the group’s legacy. However one feels about a particular case, the viability of the idea of ‘offensive misappropriation’ is a clear indicator that bonds to specific communities may now be stronger than bonds to the culture. That’s surely one reason the idea of “tribalism” has become the word of the moment in discussions about current American attitudes. 1 New York Times, June 20, 2018, p. D7.